Breakfast and unlimited WIFI included in all ibis Styles rates. Just 55 yards (50 m) from metro line 9, and boasting quick and easy access to downtown Paris with its Grands Boulevards, the Galeries Lafayette department store, the Champs Élysées etc. Whether your stay is for business or pleasure, discover our inviting, modern and cozy rooms equipped with a comfortable bed and a functional bathroom. Ideally located at the last stop of metro line 9, the ibis Styles Paris Mairie de Montreuil hotel is in the downtown area, close to the "le Méliès" cinema, Nouveau théâtre de Montreuil and the town hall. A 5-minute walk to the Grand Angle shopping center Easy access by public transport to Gare de Lyon (20 minutes), Gare de L'est and Gare du Nord (35 minutes), Gare Montparnasse (40 minutes). Lots of restaurants nearby. By car: 25 minutes to Roissy Charles de Gaulle airport, 35 minutes to Orly airport. Montreuil is the 5th most populous city in the Ile de France region. Rich in history, with industrial and horticultural heritage, Montreuil is characterized not only by its social and urban diversity but by its energy and progressive drive. 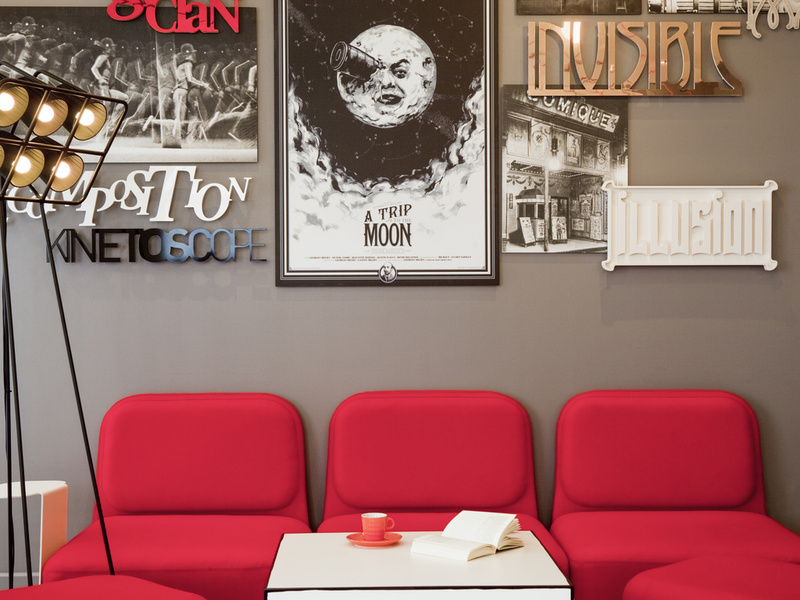 The redesigned ibis Styles Paris Mairie de Montreuil hotel welcomes you with decor themed around cinema and the magic of 1900s Montreuil. The breakfast room features a view of a peaceful and relaxing Japanese garden. Room for up to two people with a large bed. The room is decorated around a 20th century cinema theme. A very comfortable peaceful haven in the heart of Montreuil with a large duvet, flat screen TV and free WIFI. Room for up to two people with separate beds. The room is decorated around a 20th century cinema theme. A very comfortable peaceful haven in the heart of Montreuil with large duvets, flat screen TV and free WIFI. Our bar features a contemporary, backstage decor, ideal for sampling our "good mood food" menus or simply enjoying a drink. Travelled with my10-year old. Got a quiet room facing the garden. Good beds, good room temperature (I’m sensitive to draughts and AC). For us the location was perfect (relative living nearby). 3mins to the Mairie de Montreuil tube station (final stop on line 9) and 5 mins on tube to nearest large stop (Nation). There is also a bus stop on the Town Hall Square and we took it once to Porte de Lilas. We stayed four nights at the hotel. Good breakfast (freshly squeezed orange juice etc), helpful staff, clean room. Note this is not central Paris and not a ”tourist” area as such. Several French guests staying at the hotel. Best way to get from Ch d Gaulle: RER train to Gare du Nord, then line 4 to Strasbourg Saint-Denis (direction Mairie de Montrouge), change to no 9 to Mairie de Montreuil. Approx 1 hour, if you get a RER train that is ”fast/direct”, otherwise 15 mins more. I’ve visited Paris more than 10 occations and was happy with this hotel, for my needs. Room was cosy and warm enough, also very quiet. Close to public transportation and shops and restaurants. The price seems very reasonable for the small but stylish room and the excellent breakfast. It was already the third time we stayed here during our stay in Paris. The metro is very nearby and line 9 brings you to the most important places to see in Paris. The rooms aren't big but have everything you need ! Breakfast is for French standards very good ! Overall a nice place to stay when you visit Paris ! Easy you should invest heavily in using this model with other IBIS hotels. The Ibis in Porte de Montreil is very poor, very dirty. The usual Accor standards is achieved. just the breakfast is disappointing. no vegetables at all. the croissants were cold . and tasted like they are not freah. Clean, comfortabele, quiet room. Good bed & pillow. Sufficiënt lighting. Chair in the showen & toilet room , appreciatie it as a senior customer. Breakfast with fresh products. Enjoyed them. A good stay. Plenty to choose from for breakfast especially if you need enough to keep you going for a few hours. Room clean with the best pillows (for me) I have ever had in a hotel. Would like some for home! Pleasnt staff. We chose this hotel as it was close to where our son and partner live and we were going to meet our new grandson for the first time. The hotel exceeded our expectations, especially for the price we paid. We were very happy with the breakfast; I particularly enjoyed the fresh fruit salad and the fresh orange juice. The room was very clean and more than big enough for what we wanted - and there was an iron and an ironing board, which we did not expect. Towels were changed daily and the room was also cleaned daily. The air conditioning worked well, which was very much appreciated in the extremely hot temperatures we experienced whilst we were there. We found most of the reception staff very friendly and eager to help. The hotel is convenient for getting into the centre of Paris, although on this occasion we did not go as we were there to see family. There are plenty of bars and restaurants in the area and nice ice cream stall in the square. We would not hesitate to use this hotel again. Dear Stephen, Thnak you very much for your comment. We are veruy pleased if you had enjoy your stay. We hope to see you soon again. Best regards. Friendly, helpful staff on reception. Hotel kept very clean. Enjoyed the breakfast, especially the fruit salad and the fresh orange juice. Bed very comfortable. Air conditioning worked well in the extreme heat. Overall, a very good experience and would return. Convenient located, close to Metro, parking for car. Pleasant experience, perfect room, great breakfast. A pity our room was opposite the elevator. Large group leaving early Sunday morning, quite noisy ! The rooms have sufficient space, the design is modern. You are offered a drink at your arrival. However, the people at the reception are not always very nice and question you as suspicious person. Television doesn't have football channels available. Dear Guets, Thank you for your feed back. We are pleased if you have enjoyed the hotel. We are sorry for your recpetion experience, but people ask questions only for security reasons. We hope to see you soon again. Best regards. As always, I enjoy this hotel for its location, its service, and its breakfast ! !